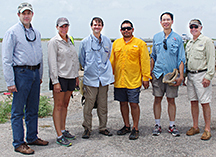 The San Bernard mouth restoration engineering team stands next to the ICW at River’s End. Left is Christopher Sallese, Project Manager, Dannenbaum Engineering; Susie Alford, President, CEO Berg Oliver; Tim Osting, PE, D.WRE, Aqua Strategies Inc; David Flores, RPS Group; Ernest To, RPS Group and Ken Wright, Friends of the River San Bernard representative. "This is a very complex ecosystem that is influenced by so many factors. The study team needs to fully understand these factors before we develop the alternatives for long term solution that does not harm this delicate ecosystem. This effort is going to require collaboration from all the stakeholders to include the local, state and federal officials as well as the public. We are under way and expect to achieve desirable results for everyone……especially mother nature." On Friday, July 11, 2014, the group set out by boat from River’s End for a two-hour tour of the closed mouth of the river to analyze environmental conditions of the area needed for purposes of reopening the mouth. Funds to reopen the mouth come from the RESTORE Act related to the Deepwater Horizon spill. 80 percent of all penalties related to the DP spill are dedicated to a Gulf Coast Restoration Trust Fund that will be used for ecological restorations which, hopefully, the reopening of the mouth of the San Bernard will be one of them.